Dinara Kasko is a 28-years-old pastry chef from Ukraine graduated from University of Architecture and Design and worked as an architect-designer and a 3D visualizer. From the moment she got into patisserie, Dinara decided to try to add something new into it realizing that the appearance is as important as taste. She tried to model her own moulds and print them with 3D printer. She also has cooked up an algorithmically-modeled cake made of eighty-one pieces, each with their own unique shape, for a creation that highlights Barry Callebaut’s product “Ruby Chocolate” at the ruby chocolate event in Shanghai. One of the biggest chocolate producers in the world, Callebaut invited four pastry chefs, including Kasko, to present the chocolate in a signature creation. The idea was to create a set of elements that works together in a larger composition using the graphic algorithm editor Grasshopper. 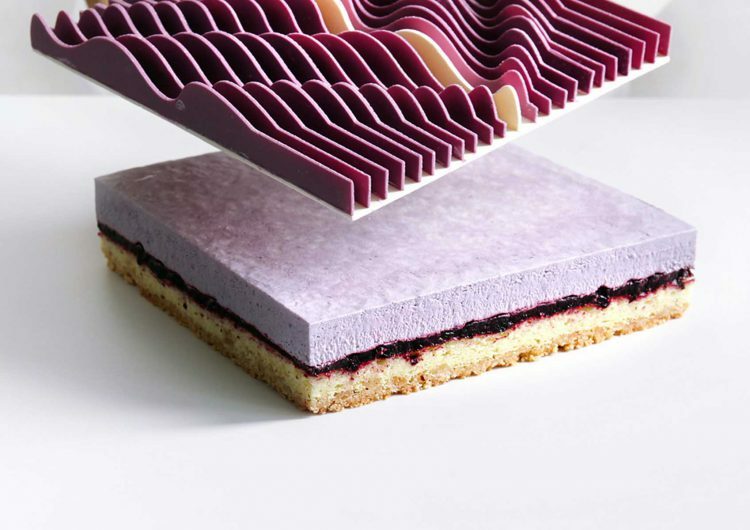 Dinara uses it to create a mold for the eighty-one piece cake; the angled forms worked together to create an overall dynamic shape, but the chef’s creativity could also be found inside each of the cake piece. In its interior, the cake contained a mousse, ganache, and meringue of chocolate ruby. The berry confit at the center of each piece emphasized the berry flavor of the chocolate and was complimented by a biscuit below. Another famous geometrical performance was the “Kinetic Tarts” created for the new issue of SoGood Magazine. In collaboration with José Margulis, an artist from Miami, USA, Kasko works with geometric abstractionism and kinetic art. José forms his 3D sculptures from layers of colourful plastic sheets, creating a geometric pattern that changes depending on the viewing angle. “It had to be an installation-performance where the art was created by José Margulis and then transformed by me into an edible piece of art which would be later consumed – thus disappear,” said Kasko. 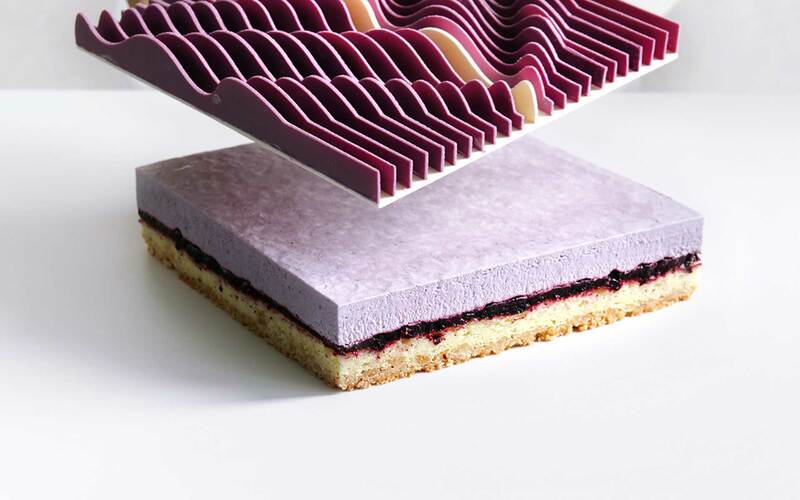 Industrial cutting machines were used to slice up the sheets of red and white chocolate, before each was assembled on top of a square-shaped almond sponge cake with a blackberry-blueberry mousse and mascarpone. Kasko wants to expand observer’s boundaries of what a cake can be by leaving a lasting impression related to the appearance and taste.